TOP MESSAGE | JFE Holdings, Inc.
Amid a rapidly changing business environment, the JFE Group has strived to achieve sustainable growth and enhance its corporate value by committing to the vision “contributing to society with the world’s most innovative technology” and by leveraging its technological advantages, diverse workforce and comprehensive strengths across a broad scope of business. The current business environment in which we operate is showing steady economic growth in both domestic and international markets, despite the heightened risk of protectionist trading, originating from US policy. In addition, we are seeing structural changes underway in our staple industries, including the automobile and environmental energy sectors. Adapting to these changes and leveraging new and innovative digital technologies will naturally lead to new business opportunities and strengthen our competitiveness in the market. However, we cannot be too optimistic from a long-term perspective. Although international demand is expected to rise along with the economic growth of emerging countries, domestic demand is likely to decline slowly due to the population decrease. In addition, the actual implementations of global frameworks are coming to life in the effort to realize a sustainable society. The United Nation adoption of the Sustainable Development Goals (SDGs) and signing of the Paris Agreement to control climate change are examples. The sustainable growth of the Group vitally depends on accurately discerning and quickly responding to these trends in our business environment. We have been making steady progress on major initiatives defined in the Group’s Medium-term Business Plan (FY2015–FY2017), including measures to strengthen the foundation for our domestic income in order to increase our market competitiveness. We have also been actively working on initiatives for strengthening corporate governance and environmental management to establish a corporate structure in order to ensure sustainable growth. In April 2018, we announced our Sixth Medium-term Business Plan to guide our business operations for FY2018–FY2020. In accordance with the plan, we are taking full advantage of our technological capabilities, state-of-the-art technologies, Group coordination, and diverse workforce to advance strategically in growth areas. This will help to ensure our competitiveness in the prevailing business environment. 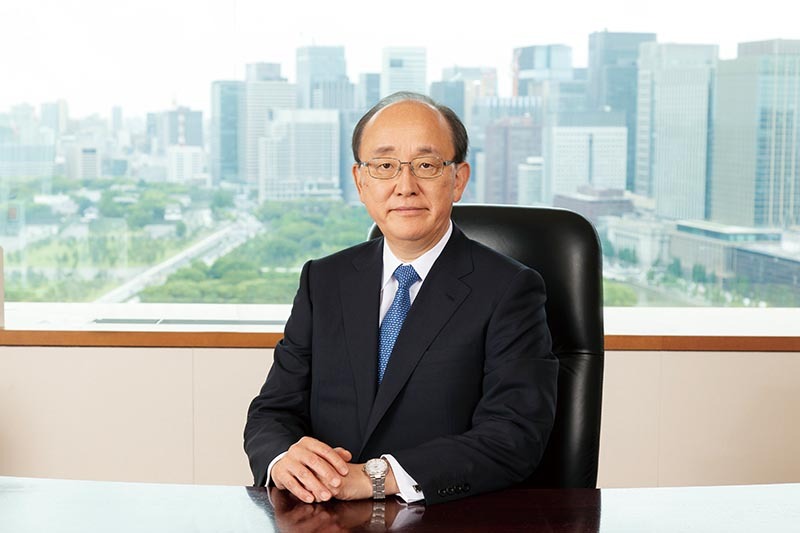 Also, in terms of our medium-to-long-term effort to enhance our corporate value and contribute to the establishment of a sustainable society, this business plan places high priority on strengthening our corporate structure conducive to sustainable growth, especially through the continuous addressing of ESG issues. In Environmental, we have positioned environmental protection as one of the highest priorities. We are actively working on reducing our environmental load. Along with efforts to reduce CO2 emissions and reuse water and energy in our steelmaking process, we are also developing and offering eco-friendly products, technologies and recycling solutions. In Social, we are placing emphasis on securing and developing our human resources. We believe that we contribute to enriching society by developing and offering products and services that excel in functionality as well as quality, and this requires capable human resources. With initiatives such as workstyle changes, operational reforms, human resource development, knowledge transfer and diversity improvement, we are continually enhancing our workplace environment so that our diverse workforce can perform at its best. In addition, we believe that respect for human rights should be a fundamental component of our business management. To make our position clear, we have established the JFE Group Human Rights Basic Policy, to be adhered to by all affiliate companies, officers and employees. In Governance as well we have introduced measures in the past to improve our governance structure. For example, we established our Basic Policy on Corporate Governance and Nomination and Remuneration committees, we began analyzing and evaluating the effectiveness of our board of directors and using the result to enhance the compositions of our board of directors and audit and supervisory board, and we have introduced the so-called “Medium-to-Long-term Performance-linked” remuneration for directors. Going forward, we intend to monitor these measures to confirm their effectiveness. In addition, we continue to introduce greater fairness and transparency into our management structure while at the same time further improving two-way communications with our stakeholders and effective information sharing. This report includes a new section dedicated to the value of steel. Its qualities, such as the plentiful supply of raw materials, high recyclability, low environmental impact and sustainability throughout its lifecycle are introduced in an organized manner. We hope that this will help stakeholders more accurately understand the value of steel. We believe that our mission is to continue providing steel and in turn support the continual growth of the global economy. As such, we continue to work on advancing the material and further reducing its environmental impact. In addition, to maintain the sustainability of the Group as a whole, it is extremely important to recognize and respond to the CSR challenges in each stage of our value chain, upstream to downstream, and distributed around the world. In this report, we have depicted our steelmaking, engineering and trading companies as well as associated suppliers, clients and societies as part of our value chain and identified CSR challenges associated with each of them and how they are currently being managed. We are constantly on the lookout for the latest information and technology and intend to continue this discipline of identifying challenges and expanding countermeasures toward ensuring the Group’s sustainability. Last year, we identified and publicly announced our material CSR issues to ascertain issues along with the associated countermeasures and creation of opportunities that are the most impactful and meaningful to stakeholders and to understand how to more effectively allocate our corporate resource to bolster our value in society. These material CSR issues were identified with consideration for corporate governance and respect for and awareness of human rights, and they clarify the Group’s priorities in five areas: providing quality products (customer satisfaction), protecting the global environment, ensuring occupational safety and health, recruiting and nurturing diverse human resources and thoroughly enforcing compliance. In FY2017, we set up a KPI for each operating company to monitor progress against these material CSR issues. Each company will carry out activities to achieve these targets. We will manage and monitor CSR issues by effectively iterating through PDCA cycles. Under the Group vision of contributing to society with the world’s most innovative technology and through initiatives to address material CSR issues, we strive to maintain the sustainable growth of the Group, increase our corporate value and ensure the sustainability of the global society.